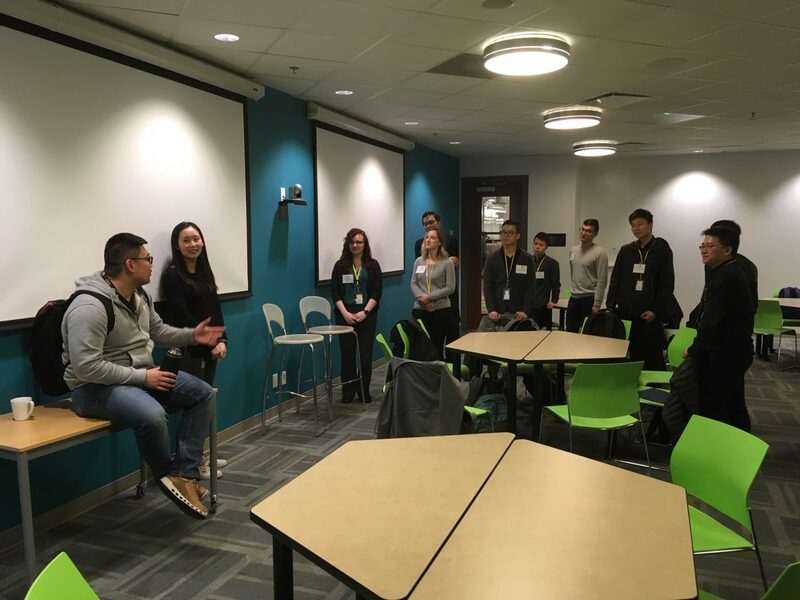 On January 23, 2019 BCIT CST and CIT students had the incredible opportunity to attend a tour of SAP’s Vancouver Office. Upon entering, we were greeted by several SAP employees including Joseph Hou, and many current SAP interns. Susanna Kan, our co-op coordinator introduced us and we were led into a presentation room to relax. When every student has arrived at SAP, Joseph began a warm welcome for all of us, and introduced SAP’s Intern Experience Program. We learned about the incredible opportunities within the program, including intern hackathons, mentorships, workshops, intern projects, and many more. Next, the current SAP interns introduced themselves and their currents roles. We got to hear their various work experiences, and many aspects of company culture that they particularly enjoyed. One example was the Month of Service, when SAP employees volunteered to support their communities. Afterwards, each intern gave us very helpful, personal advice to becoming successful in the co-op program, balancing job search with studies, and ended with a kind word of encouragement to everyone. After the presentation, the interns along with several SAP managers and employees joined each of the tables of CST and CIT co-op students to answer any questions we had. The managers were very friendly and down-to-earth with answering any inquiries about expectations, their department’s work process, hiring processes, and anything else. There were rotations throughout the Q and A to ensure everyone got to meet and network with several managers, employees and interns. The conversations were very lively at every table, and many managers continued to explain in depth answers past the end of the question period. One of the managers explained how in software development, their highest priority is always to produce code with minimal bugs. He told us how his team checks their code through an extensive amount of tests to ensure there are no risks before considering how to optimize the program further. After the Q & A session, we went on a tour of the office led by the same group of interns, whom answered any further questions we had and how to prepare for interviews at SAP. They led us through each of the 3 floors, which each had its own themes. We began by visiting the kitchens spread throughout the office, which were stocked with free fruit and drinks along with wonderful meals. Next to it were 3 meeting room called the Peaks as each room is named after a mountain. On the other side was the Micro-Market, which contained highly subsidized vending machines, frozen treats, and snacks. 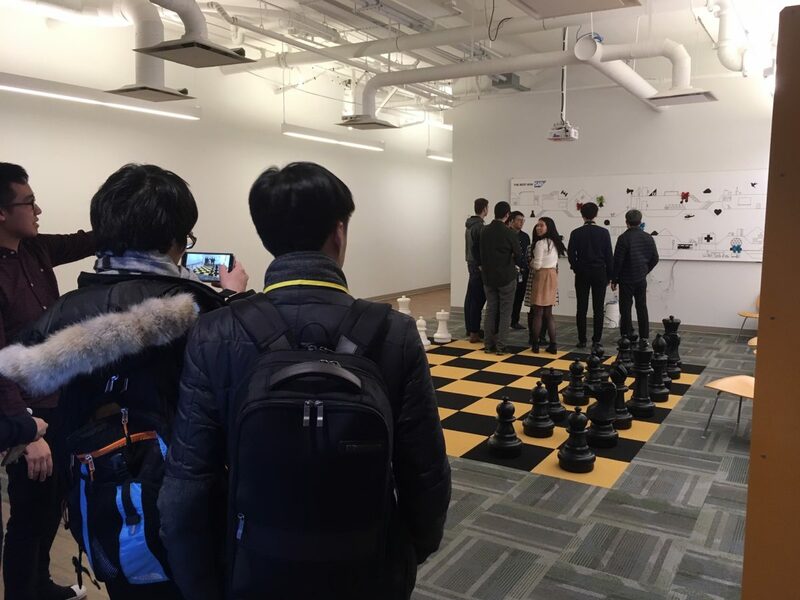 We were then led to various relaxation facilities such as a meditation room, puzzle stations, nap rooms, massages, a massive chess set, an art room where anyone can draw and color on walls, and a large game room where employees can hang out and enjoy ping pong, foosball, pool, and many more. For physical activities, the offices also contains a gym, yoga room, bike rentals, and boxing room. A common theme throughout the tour was that the office had many interesting projects made for fun by employees that have received company funding. 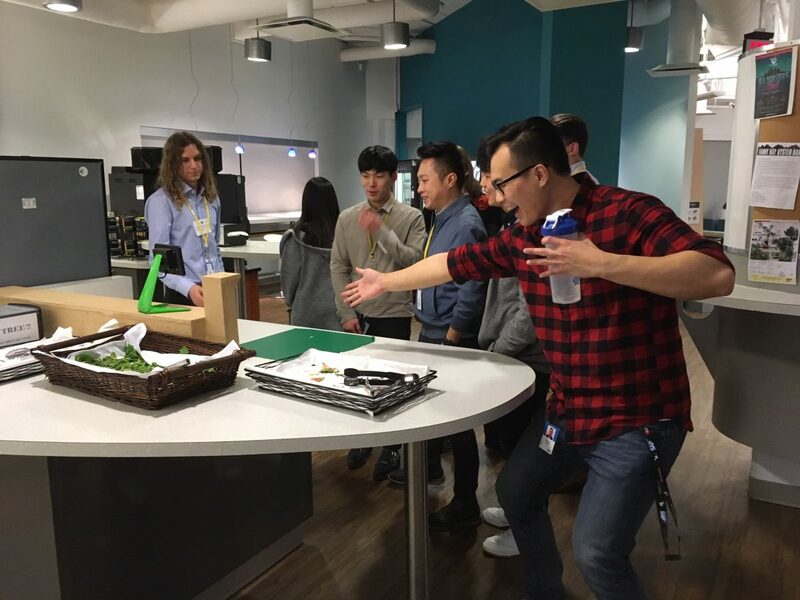 These all originate from the D-Shop, a global SAP program that gives interns access to hardware technologies and encourages creative spirit and self learning as a company culture. One of the projects we saw was LastBytes, a software that takes a picture and helps you sort recyclables and garbage. Some others included an Air Quality Analysis device that monitors workplace air quality, and a voice controlled system that changes the ambient of colors in the D-Shop. After the tour many SAP employees further volunteered their time to stay even later to answer our questions, to which we were very thankful. This was an incredible event where we were able to meet and learn plenty about SAP’s company culture and various opportunities for employees. We were able to see SAP’s dedication to the well-being of their own employees, and promote diversity and lifelong learning. We would like to give a special thanks to Joseph Hou and Jessica Gutierrez for inviting us and making this event possible. Both of them were once co-op students whom have now gone great lengths to help and pay it forwards to future co-op students. We are all incredibly grateful for this experience, and hope we can contribute the same for future co-op students.